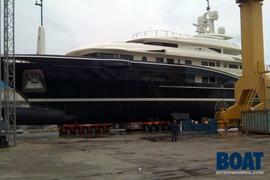 Rossi Navi's hull FR20 was revealed to the world yesterday as she left her shed at their yard in Viareggio. We now know that this impressive 70m yacht will be called Numptia. Built in steel and aluminium, her naval architecture is by Axis Group Yacht Design and exterior design by Studio Spadolini. The interior has been designed by Studio Salvagni and will accommodate 12 guests and a crew of 19. The hull has now been transferred onto a barge for the journey to La Spezia, where Numptia will be launched next week.